The Canadian Housing Statistics Program (CHSP), a program mostly based on administrative data, is designed to produce timely information on how different social, economic and demographic factors are shaping the evolution of Canadian housing markets. The use of administrative data is a key element in Statistics Canada's modernization effort to produce statistical information that is comprehensive, cost effective and timely. Data under Statistics Canada's auspices are protected to ensure privacy and confidentiality. Since the late 1990s, immigration has been the key driver of population growth in Canada. As a result, immigrants are now an important segment of the population in Toronto and Vancouver. According to the 2016 Census, immigrants represented 46% of Toronto's population and 41% of Vancouver's population. This study compares patterns of homeownership among immigrants and Canadian-born residents, focusing on the valuation of residential properties in different segments of the housing markets of Vancouver and Toronto. It highlights large differences in the relative value of immigrant-owned single-detached properties in Vancouver, differences which are less apparent in Toronto's housing market. All estimates in this study exclude properties owned by non-residents, which were addressed in a previous study. The current study does not attribute changes in property prices in Toronto and Vancouver to any specific socio-demographic or economic factor. To disentangle the causal impact of these factors, comprehensive socio-economic information over many years would be required. Currently, CHSP data contain property value information for a single year only (2016 for Toronto and 2017 for Vancouver) and therefore cannot be used to correlate past movements in property prices with past changes in housing demand and in housing supply. Nevertheless, the study provides more detailed information than was previously available on the degree to which immigrants are integrated in different segments of the housing market in both cities. This information provides a richer understanding of the housing market in these cities. Immigrants own 43% of all residential properties in Toronto and 37% of all residential properties in Vancouver (see note to readers). 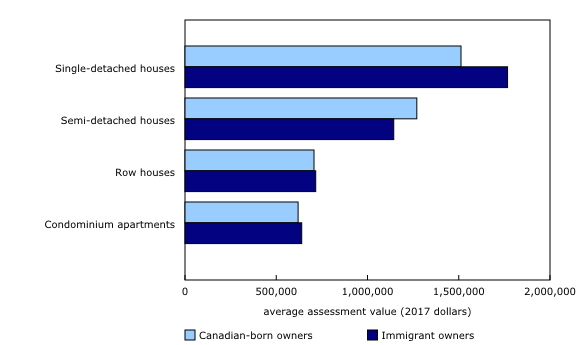 In both census metropolitan areas (CMAs), the overall mix of residential dwellings owned by immigrants differs from those owned by Canadian-born residents. In Vancouver, single-detached houses account for 39% of all immigrant-owned properties, compared with 48% of properties owned by Canadian-born residents. In Toronto, about half of all properties owned by immigrants are single-detached houses, compared with 60% of properties with Canadian-born owners. Immigrant-owned single-detached houses in Vancouver that are have an average assessment value of $1.8 million, $255,100 more than the average value of single-detached properties owned by Canadian-born residents. Most of this difference can be explained by the age, size and location of these properties. Conversely, the age and family income of property owners do not explain these differences in average property value. Comparable differences in property value between immigrant and Canadian-born owners are not apparent in Toronto. Immigrant-owned single-detached homes in Toronto have an average assessment value of $829,800, about $20,000 less than the average among Canadian-born owners. 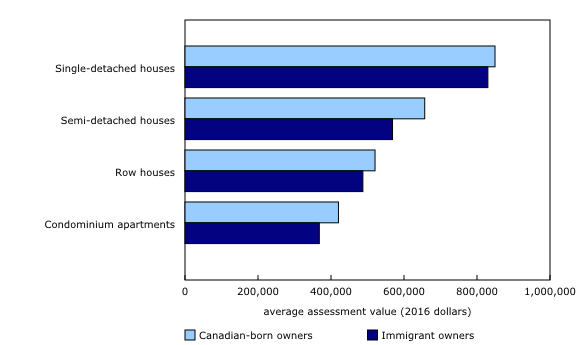 When differences in the age, size and location of properties are taken into account, immigrant-owned properties are valued at over $50,000 less than those owned by Canadian-born residents. In Vancouver, larger differences in property value between immigrant and Canadian-born owners are apparent when focusing on single-detached properties owned by recent immigrants. Recent immigrants—defined as individuals who immigrated to Canada from 2009 to 2016—own 5% of all single-detached properties in the Vancouver CMA. These properties have an average assessment value of $2.3 million, $823,900 higher than the corresponding average for Canadian-born owners. About 60% of this difference in value can be explained by the age, size and location of these properties. Conversely, differences in age and family income of property owners do not explain differences in average property value. 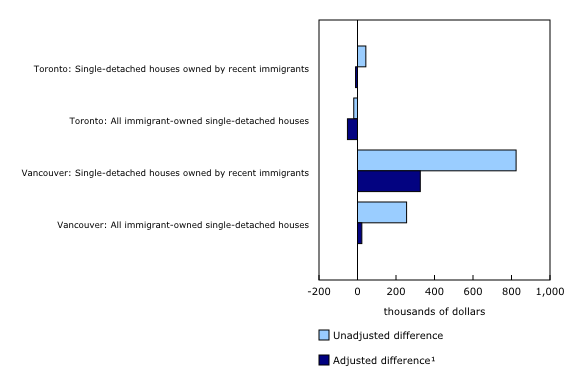 In Toronto, recent immigrants own 4.7% of single-detached houses. Differences in property values between the single-detached houses owned by recent immigrants and Canadian-born residents are far less pronounced in Toronto than in Vancouver. At $892,600, the average assessment value of single-detached houses in Toronto owned by recent immigrants is $43,300 higher than the average among Canadian-born owners. In Vancouver, differences in property values between recent immigrant and Canadian-born owners vary substantially when immigrant owners are examined separately on the basis of their immigration category (that is, the type of program used to facilitate entry into Canada) and their country of birth. Recent investor immigrants, as a group, generally own more expensive single-detached properties in Vancouver than their counterparts who came to Canada under other immigration programs. Differences in property values are observed not only across immigration categories but also across countries of origin within a given immigration category. For example, recent investor immigrants born in China and Iran own higher value single-detached properties in Vancouver than those from other countries. In Toronto, recent investor immigrants also own more expensive single-detached properties than their counterparts who came to Canada under other immigration programs. Differences in property value between recent investor immigrants and Canadian-born owners are less pronounced in Toronto than in Vancouver. The estimates reported in this article are based on new data developed by the Canadian Housing Statistics Program to support research on immigration and housing. These data contain information on the size, age and location of residential properties, along with their assessed value. The data also include information on the age, family income and immigration status of property titleholders. Estimates are based on single-structure, standard dwelling types, including single-detached houses, semi-detached houses, row houses and condominium apartments. The sample was restricted to residential properties owned solely by individuals who are Canadian residents. Properties owned by non-residents were addressed in a previous study and are therefore excluded from the study. The research article "Immigrant Ownership of Residential Properties in Toronto and Vancouver," which is part of Economic Insights (Catalogue number11-626-X), is now available. To enquire about the concepts, methods or data quality of this release, contact Guy Gellatly (613-415-6894; guy.gellatly@canada.ca), Analytical Studies Branch.